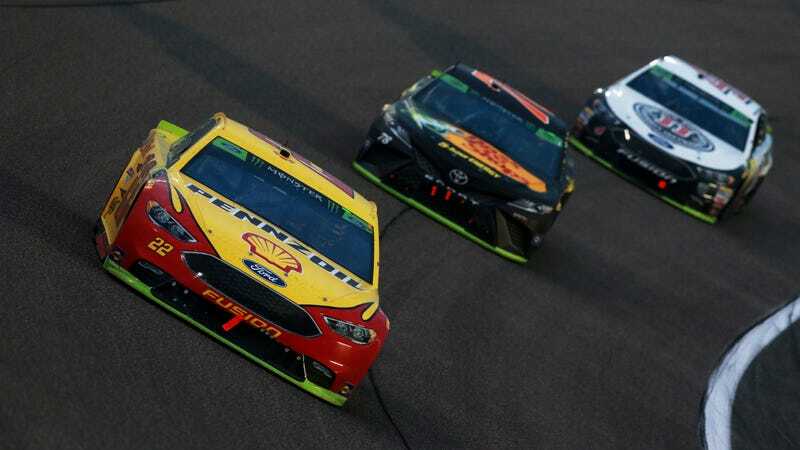 Coming into the final, title-deciding race in the Monster Energy NASCAR Cup Series, it was Joey Logano versus the Big Three—the season’s three dominant drivers, who have won 20 of the year’s 36 races combined. Despite it all, Logano came out of the race with his first Cup Series championship. NASCAR’s new rules mean the championship titles in its top three series come down to four drivers and one race, in which the four “playoff” drivers left race for the title at Homestead-Miami Speedway and the highest finisher amongst them wins it. That was Logano this time around, winning the race and the title ahead of a top four that consisted of every driver left in contention. The other three drivers left in contention—and in the dust by Logano, on a late-race restart—were Martin Truex Jr., Kevin Harvick and Kyle Busch, who finished second, third and fourth in the race, respectively. Those three have dominated NASCAR headlines all year, winning nearly two-thirds of the races combined and getting a completely original nickname of “The Big Three” in the process. But everyone competing for the title starts on the same level for the final race, and, as has been the case in the final race of the year since NASCAR introduced the “one race decides it all” rules a few years ago, the four drivers racing for the title hovered around the top five spots in the running order all day. They spent most of the race trading the lead between each other and eliminated playoff driver Kyle Larson, who hit the wall late in the going. The only drama for most of day consisted of the final four drivers shuffling around the top spots, with the race looking like it might go caution free, other than to end the stages, like the other two championship races did. But things picked up late in the race, with Larson popping a tire with around 70 laps left and Daniel Suarez spinning with 20 to go. Busch had problems all night with pit stops, and ended up staying out during green-flag stops on a risky strategy play that worked well enough to keep him in contention thanks to Larson’s caution, but not well enough to make him champion. It was a late restart that sent Logano sailing ahead of his three competitors for good, doing what most probably didn’t see coming—defeating the dominant forces of the season for his third win of 2018, and staying safely enough ahead of Truex, who’s said openly that he’d wreck Logano to win the title after Logano wrecked into him at Martinsville Speedway to advance to the final race, at the end. Logano beat the Big Three in terms of laps led in Miami, too, qualifying fifth for the race staying out front for 80 of the 267 laps on Sunday. Truex led 20, Busch led 21 and Harvick led 58, while Larson and Denny Hamlin were the two non-title drivers who had a decent amount of time up front during the title race. Logano and his team had short-run speed during the race, and said they were “waiting for nighttime to come” to show that they really had. They got a short run under the lights to end it, and that was all they needed. But, of course, the race isn’t truly over until inspection is, and we’ve seen wins discounted due to cheats discovered during inspection as recently as earlier this month. We should know if Logano gets to keep his title by the end of the night.